Four fantastic student-performed plays for you to see this term! 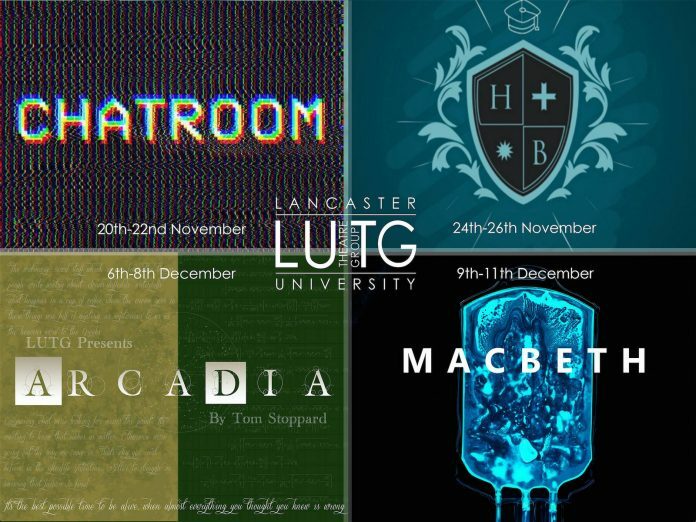 Following a ballot of members last term, and a week of auditions on Week 1, Lancaster University Theatre Group have now begun to rehearse their Michaelmas shows, a season of four plays, ranging from Shakespeare’s Macbeth, to modern classics Arcadia, The History Boys, and Chatroom. Macbeth has been promised as ‘not a traditional take on Shakespeare’ and will be performed in the Nuffield Theatre on campus. Directed by James Bone and Connor Axiotes, the play’s setting has been updated to a post-war hospital, with all the characters suffering from various ailments, and Lady Macbeth being confined to a wheelchair for the play’s entirety. Perhaps the most avant-garde of LUTG’s Michaelmas offering, the play has been cast gender blind, and is the largest student production to be staged this term. Also being performed are two classics of the last thirty years. Arcadia directed by Connor Gould, and The History Boys directed by Jamie Lonsdale. Arcadia, set in two time periods, explores the relationship between the past and present by juxtaposing the activities of a manor house’s modern residents with those of the 19th Century. Set to be performed in The Storey, the black box nature of this space presents a challenge to the show’s creative team over how to depict the setting. The History Boys, perhaps even more iconic, is set to be performed in the Nuffield. The set design will experiment with different levels, and make the most of the school setting. It will be interesting to see how the creative team produce an original take on such a well-known play. Finally, to be performed in the Playroom is Enda Walsh’s Chatroom directed by Beth Manicom. It follows five teenagers who meet online, and coerce each other into bad behaviour. Perhaps the most relevant of the four plays, it tackles themes of mental illness and life in the age of the internet. These are four plays that will hopefully surprise and shock us with new interpretations. Chatroom will be performed on the 20th – 22nd November, followed by The History Boys on the 24th to the 25th. Arcadia will be performed on the 6th – 8th December, and Macbeth on the 9th to the 11th. All four plays will be reviewed in later editions of Carolynne. Previous articleWhat's in my Wardrobe? Next articleOlympic Karate: A positive or negative for the sport?